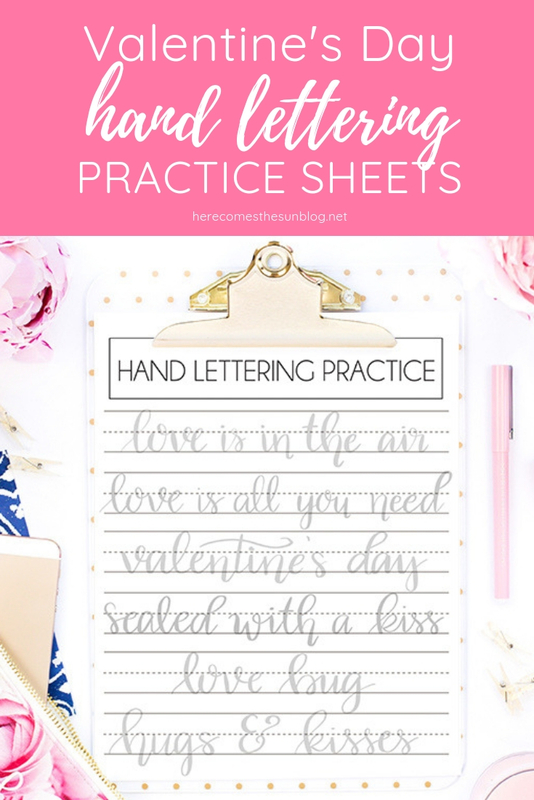 These Valentine’s Day hand lettering practice sheets make hand lettering easy so you can create the perfect Valentine’s Day gift. Use them to get started in hand lettering or to brush up on your skills. Valentine’s Day is almost here! Have you ever wanted to make that perfect gift for someone using your own hand lettering? These practice sheets will help you do just that. Practice your lettering and then use your skills to create a hand lettered card, photo frame or anything else for that special someone. Hand lettering is not as hard as it looks and I’m here to show you how to do it. 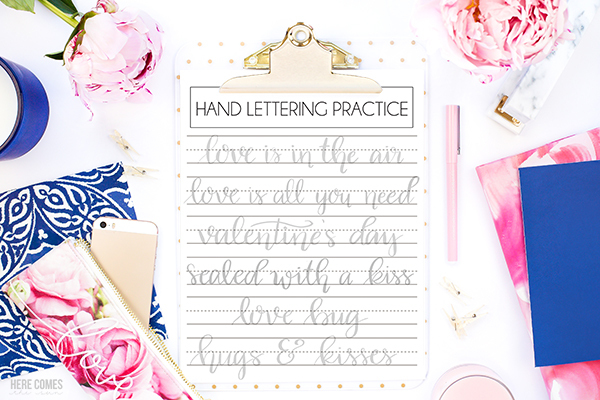 And I’m so excited to be teaming up with some talented bloggers today to bring you 6 more love themed hand lettering sheets. Be sure to scroll to the bottom to see all the creative designs. Download the practice sheets and print them out on your home computer. The practice sheets are located in my resource library, which you can access at the bottom of this post. I recommend using either the Tombow Dual Brush Pens or the Tombow Fudenosuke with these practice sheets. The Dual Brush Pens will give you a thicker line and the Fudenosuke (soft tip) will give you a thinner line. If you prefer to work digitally, download the practice sheet file onto an iPad pro. Then, use a calligraphy brush in the Procreate app to trace over the letters. Check out this post for how to hand letter on the iPad Pro. In addition to the practice sheet with words, the download also includes a blank practice sheet so you can practice whatever letters or phrases you like! If you are new to hand lettering, this post will teach you the basics of hand lettering. As always, these sheets are for personal use only. You may not sell or redistribute them. You can check out all my hand lettering posts here. 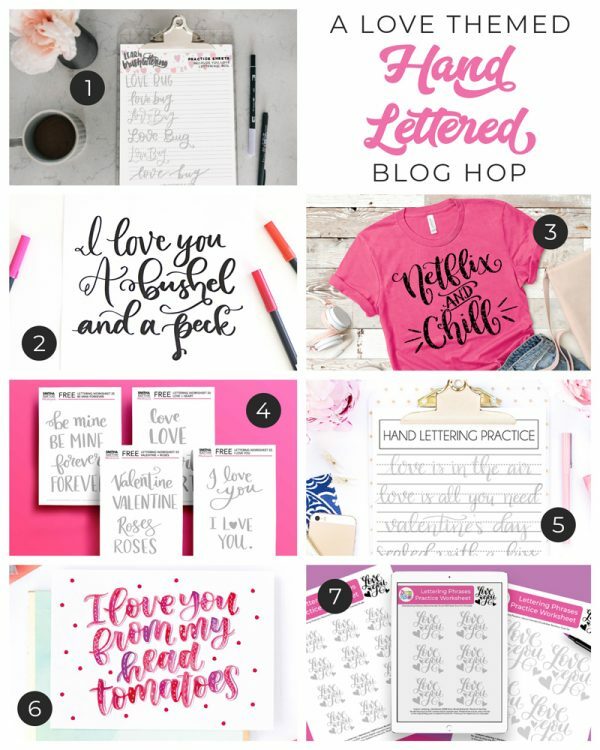 Be sure to check out all the fun lettering projects from my blog friends below!